In this guide we take you through our top 7 picks for artificial grass (also known as ‘fake grass’ or ‘astro turf’) in 2019. All our products have been reviewed based on their quality, cost and ease of installation. As always our experts have scoured the market (20+ retailers) for the best deals. All our chosen grass can be installed at home without professional help. There are retailers out there that also offer installation, but we won’t be covering those in this guide. Generally installation is very straight forward, meaning fitting costs are an additional expense that we think you should avoid. The best artificial grass for you probably depends on a number of factors – including price, pile height, colour, drainage, sizing and more. For this reason our experts have looked to compare all of these factors from the best products on the market to help you make an informed decision that is best for your home. 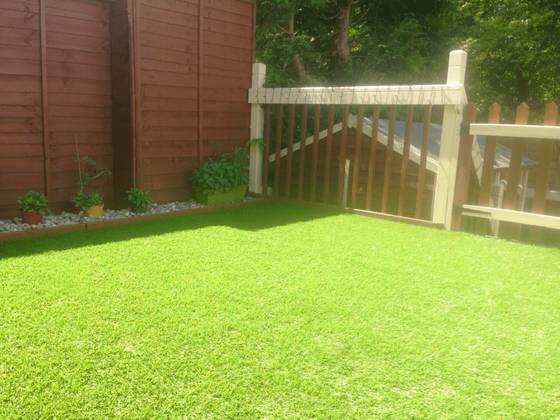 The best artificial grass going – easy to install, looks great and won’t break the bank! The most bang for your buck – a low-cost but high quality shorter grass for your garden. 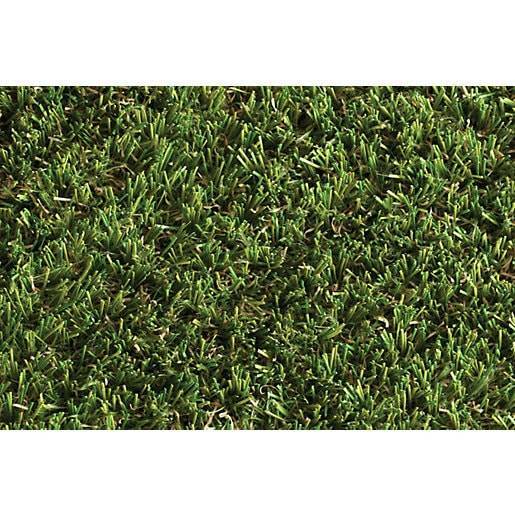 This 27mm grass is great for those who love thick but short grass. Comes with a 10 year warranty & fantastic reputation. Straight & curvy piles for a thick, dense grass. UV protection and drainage included as standard. 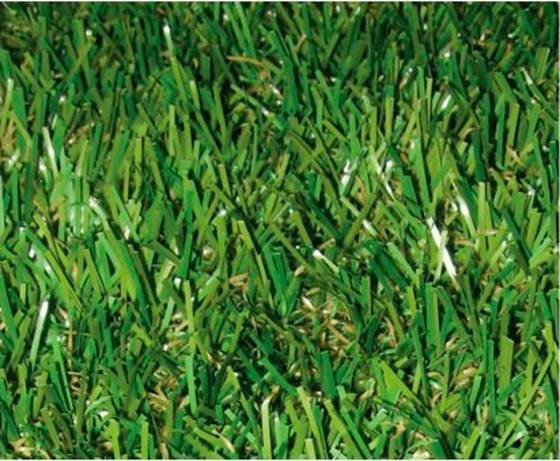 A realistic 30mm grass which is easy to install, durable and has great online feedback. Easy to install. 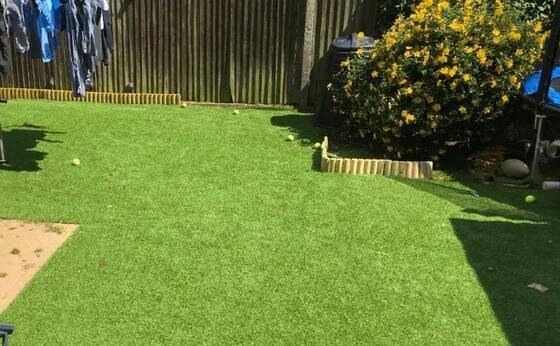 The shortest grass in our list, available in lengths of up to 25m. Looks neat & tidy! The tallest grass in our list at an impressive 37mm! Home measuring also available. 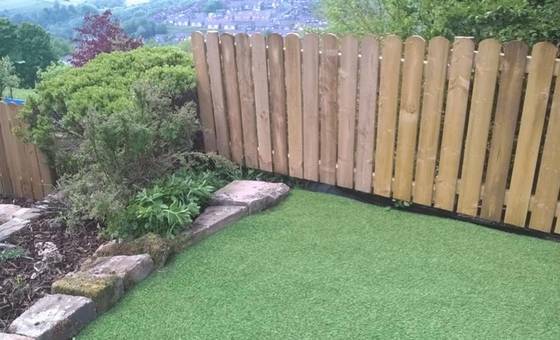 The Tuda Luxury 30mm pile height grass is our top pick for the simple reason that it has everything we would want from an artificial grass, at a superb price per metre. At an incredibly low cost per metre squared you’re unlikely to find better bang for your buck. Artificial lawn of this quality just doesn’t come at this price from any of the national DIY retailers. Granted it doesn’t include an attached weed membrane, but this can be bought separately and usually costs no more than 50p per M². Unlike most other retailers in this space, the lawn can be cut into custom sizes at half-metre variations in length which makes installation a breeze. Widths of both 2m and 4m make it perfect for both small and large gardens. If we’re being super-critical we do feel that the product could be a little bouncier underfoot but at this price you can’t have it all. 68 custom sizes available – great for finding the right fit! Child friendly – no more muddy kids! Unsurprisingly another Tuda grass has made it into our list as the cheapest option on the market. If price is your main concern, you simply can’t go wrong with the Berlin 26mm lawn. The product is available via Amazon and at its usual low price it’s a great buy if you’re looking to keep the costs of your new garden project down. Naturally we were worried that the low price would mean compensating on quality, but this really doesn’t appear to be the case. Customers have rated the product well and we honesty couldn’t tell the difference between this grass and the turf you get from any of the national DIY chains. At 26mm height it is quite thin and probably less suited for those with children given it offers less protection from bumps and falls. However for all other purposes it is ideal – especially those with dogs. Top Tip: make sure you buy some weed membrane to use with this product. It doesn’t have any built in but can be easily installed underneath the lawn at a much lower cost when bought separately. Next best in our top 7 is the Namgrass 27mm from Wickes. This is a really great product for anyone looking for a short and sharp lawn made from top quality materials. Namgrass has a brilliant reputation in the industry for quality and we found this second-to-none. They even offer a 10 year warranty on all products provided customers register with them directly after purchase. At 27mm the short grass is probably best for pet owners as it’s the easiest option to keep clean. Wickes also promote the product as being child-friendly. The only reason this product didn’t make it as our top pick was the cost – at £28.99 per square metre the price seems very excessive. This is 3x the cost of our cheapest buy, but definitely not three times as valuable. The Banbury Heavy Density 30mm lawn made it into the list given its use of straight and curly piles which give the grass a thick and heavy density. This grass is perfect if you’re looking for a lawn that looks healthy and natural. As with all B&Q products, quality is the name of the game with UV protection and drainage included as standard. The perforated rubber backing is definitely easier to install than having to use a separate weed membrane. B&Q don’t offer free samples but they do operate a 45 day returns policy, which means you can easily return your grass if you’re not too fond of the product once delivered. The product is also eligible for free delivery. The most disappointing thing about the Banbury 30mm is that it’s only available in multiples of 8m squared. Definitely not recommended if your garden doesn’t match somewhere near these multiples as you’ll be paying way over the odds! The Nomow 30mm made it into our list given its realistic appearance and ease of installation. The product comes with a rubber backing and built-in weed membrane that helps to make installation a breeze. Even those DIY’ers with little experience or confidence with home renovations will be surprised at how easily this is to install. The rubber backing means that the product is incredibly tough and is unlikely to tear easily. Why Homebase haven’t followed suit with the likes of B&Q/Wickes and begun offering free home delivery we just can’t understand. Charging £3.95 just seems self-defeating when you consider the average order value of an item such as this. However the product will be delivered at a suitable time slot, which helps redeem the cost slightly. As far as we can tell the product doesn’t have any UV protection, which could cause issues in years to come. It would be a shame if the grass did fade as it looks so natural from new. At £19.74 per sq/metre the product is twice as expensive as our top choices, so you’re really paying a premium that we didn’t feel was entirely justified. Given the product only comes in fixed widths of 4 metres, it’s also unlikely to be relevant for everybody. 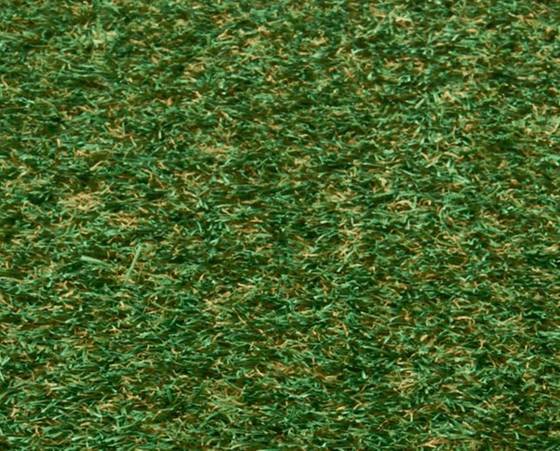 The second Namgrass to make it into our list, the Eclipse 25mm is the best choice for those who prefer shorter grass. At 25mm it is probably the thinnest looking grass in our list, but it looks very neat and tidy. We love that Namgrass products come with a 10 year warranty, as this protects you against fading and product shortfalls for a significant time period. When bought from Wickes the turf is available in 2m widths at lengths of up to 25m. This makes it fairly easy to cut into lengths of turf that can be easily installed in the garden. The product is child and animal friendly, with the short fibres easy to clean and disinfect. Wickes offer free delivery on any orders over £75 and the product can be collected for free in-store. Products can also be returned within a 14 day timeframe. We didn’t score the product higher for the simple reason that it’s fairly costly and doesn’t appear to have any drainage capabilities. £26.99 per metre is expensive – so we only recommend buying this product if you’re happy to pay more. Extortionate delivery charges – make sure you collect! The Parkgate 37mm is the tallest pile height in our list. This is best for those who like really long lawns that are quite thick in appearance. As with all the other products in our list, the lawn is UV and fade resistant. Unlike many of their competitors, Carpetright offer a home measuring service, where a representative will come and measure your garden and provide recommendations on the best lawn types and product sizing. If you’re unsure about what you’re looking for, this could work well. The company also offer interest free credit on all orders over £500 – potentially quite useful if you’d like to spread the cost of your new turf. We’d advise against buying from Carpetright if you’re looking for home delivery of your new fake grass, their delivery fee of £29.99 seems extortionate – especially when all of their competitors appear to be offering free delivery. This grass is also probably not one for those with dogs – the long pile height makes it quite difficult to clean and disinfect. You’d probably be better looking at one of the shorter options in our list. If you have young children the long pile height can work well – helping to protect from bumps and scrapes. May be a little too long & probably not suited to the tastes of everybody. Remember this grass can’t be mown! 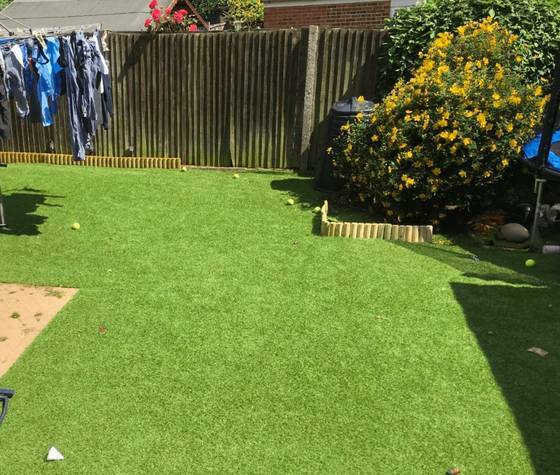 Installation of artificial grass is actually fairly straight forward and can be achieved even with limited DIY knowledge. You will receive installation guidelines with your product and even if you don’t, there are a ton of DIY help videos across the internet (see below). Order your new artificial grass from your chosen supplier. If you can, source a supplier that offers the grass in a length / width that matches your requirements. If this isn’t possible, try and get enough to match your square metre needs. Some like to order an extra 10% to account for wastage and additional requirements. You might need a turf cutter to remove any existing grass. Any old decking or patio should be removed before laying your grass. Excavate the cleared area to a depth of around 50mm and use some strong weed killer on the entire area. Spread a base layer of builder’s sand to firm-up the area. This should be spread to a depth of between 30-75mm. Consider the pile height of your new grass and how high it might appear once installed. Ideally it should be level with other areas of your garden such as the paving. The sand should be compacted and incredibly firm underfoot. Use a spirit level to check that the surface is even. You can use a scaffold board and hammer to compact the surface if you don’t want to shell out on a heavy roller. Ensure there are no bumps or debris as these will cause an uneven appearance once the artificial turf has been laid over the top. Some products have a weed membrane built into the back. If yours does not, you can buy it for next to nothing Lay the weed membrane across the entire area to offer coverage from weed growth. Nail pins into the membrane along the perimeter of your sheet to keep it in place. Unroll your lawn across the freshly prepared area. Ideally it should be laid at right angles with the rolls laying side by side once stretched out onto the garden. You may need to use a craft knife to amend the width of some rolls. If this is the case, turn the grass over and use the tread marks on the back to cut along a straight line. You must ensure that each strip of lawn is facing in the same direction, or it might be easy to distinguish between the individual strips of grass after they have been laid. Artificial lawn usually has a lean in the grass pile. Generally it’s recommended that you should point this lean towards the house – so that the lawn appears full and lush to anyone viewing it from the house. If your grass has been rolled up for a while, it may need some time to settle into its natural position once laid out on the lawn. You may need to leave the lawn 24-72 hours to lie naturally on the ground before joining the seams together. This will probably be the most difficult step when installing your new grass. The different lengths of grass will need to be joined together neatly. Where the seams for each of the artificial grass lengths meet, joining tape should be spread along the joining, underneath the grass. The grass should be folded outwards and adhesive applied to the tape, with the grass being folded back down so as to place both of the grassy edges on their own individual side of the tape (thereby joining them together). Using a hammer and joining pins, the edges of the lawn rolls should be fixed as 200mm intervals, to prevent any area of the grass becoming loose. The grass pile should naturally disguise the heads of the pins. To ensure that the pin-heads and joining edges of each grass length are not visible, you should use a wire brush to ruffle the surface of the pile and help disguise any visible signs of the installation. Your grass should now be looking somewhere near complete! If you’re happy that the installation has gone well and your pile is securely fastened, you should go ahead and tidy up any untidy corners or edges using a craft knife. Artificial grass is also known as ‘fake grass’ or ‘astro-turf’ and is a surface made from plastic polymers that is intended to look like the real thing. It is often used for sports given it requires very little maintenance and can withstand heavy footfall with little or no damage. 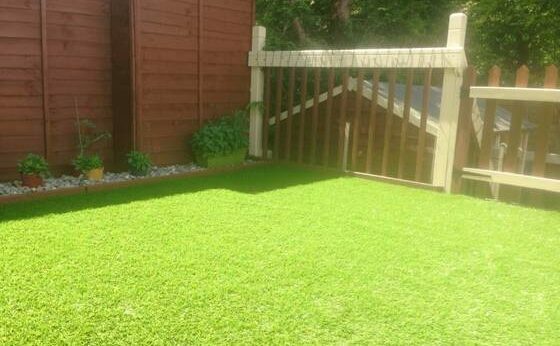 The pile height of artificial grass usually ranges from 25mm to 37mm+. Generally we wouldn’t recommend any grasses past 37mm, as they can often look squashed and ‘trodden-in’ after a fair amount of use. If you like short, sharp grass that maybe looks a little thin but at least looks neat and tidy, we recommend a shorter pile height of between 25mm – 30mm. If you’re looking for thick, quality grass with a full appearance but a little messier, we recommend you look between 30mm – 37mm. Generally any grass with a pile height of 30mm or more will look thick, natural and feel bouncy underfoot. We usually find that this height to be the perfect middle-ground that most people love. The density of a product is another factor in determining how thick and natural it looks. Generally the heavier the better, as this means more piles per square metre. Usually a weight of 3kg per metre squared signified a good quality product that should be thick enough to maintain a pleasing appearance. The colour of your new lawn is important, but really depends on your own personal preference. Most retailers will offer different colours ranging from light-green, to normal full-coloured green and even deep dark greens if desired. If you’re unsure of the pile colour before you buy, check reviews for genuine installation photos and product imagery. If still unsure, you should probably request a free sample or head in-store to purchase so that you choose a colour that is ideal for you. Usually, the best artificial grass products come with drainage holes built into the base. This prevents water building up and water-logging the garden as can happen with natural grass lawns. Despite most products offering this as standard, there are still some products out there where this isn’t the case. If drainage is important to you (for instance if you live in an area prone to heavy rainfall and flooding) then always check that drainage is included before buying. Without protection from the sun’s UV rays, many fake grasses can fade from their intended colour and look very unsightly after just a few years. It’s important that your chosen supplier has considered the impact of the sun, or you may be needing to replace your lawn sooner than you might think. There are a number of retailers out there who have begun offering 5-10 year warranties and guarantees on their products. 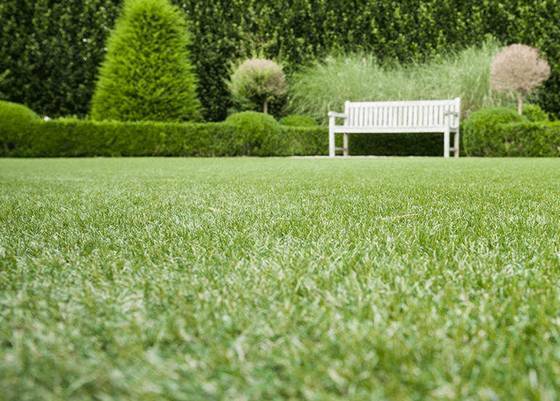 These suppliers are likely to be more expensive but it just might be worth the extra money if it guarantees the quality of your lawn for years to come. Last but not least in our list of considerations before buying is determining whether or not your new product is animal and child friendly. Some retailers will specify explicitly that their products are not suitable for this purpose. Generally these are the products that are made with cheap, toxic materials that can be harmful to humans and animals. Whether you have children/animals or not, these are products that you should probably stay clear of. Definitely not the sort of materials you want to be introducing into your home and local environment! Thankfully all of the products in our top 7 meet the criteria of being animal and child friendly. If you have a dog, we’d probably recommend looking at the short-to-mid length pile height grass, as these are generally easier to clean and disinfect.